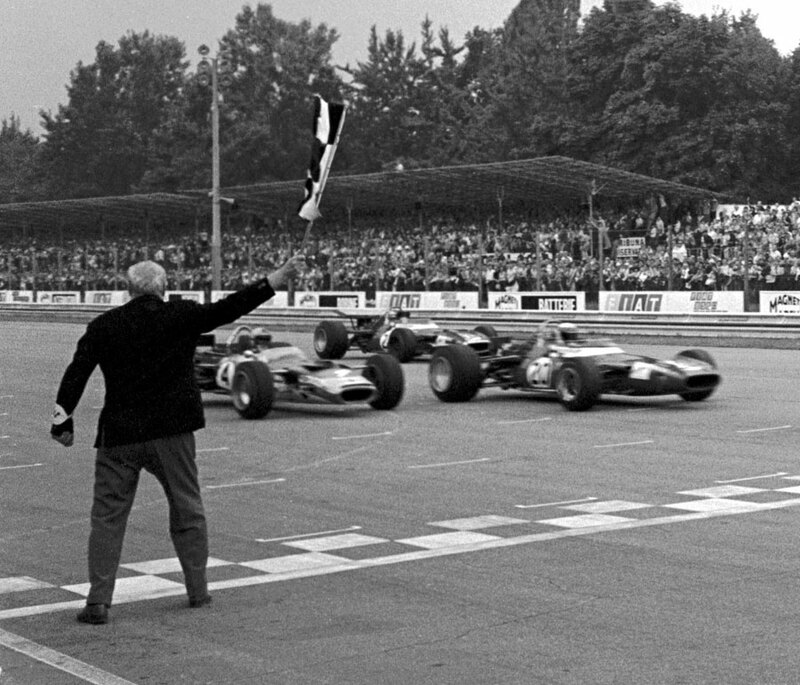 Jackie Stewart took his sixth victory of the season at Monza and in so doing secured his first world championship with three races remaining. It was hardly a surprise as he started the day needing only six points, and even then had he failed, Jacky Ickx, Bruce McLaren or Graham Hill would have needed to win all four remaining rounds. However, the race itself was a classic with a thrilling finish. Jochen Rindt in his Lotus-Ford qualified quickest on a sultry Saturday although less than a second separated the first five drivers which included Stewart in third. Stewart squeezed through Rindt and Denny Hulme on the first lap but there then followed a bitter contest which at times featured as many as seven cars within striking distance of each other. After 20 laps three-and-a-half seconds split the seven. John Surtees had an early escape when Hill's exhaust pipe fell off and part of it hit him on the head. That had less of an effect than his engine also being damaged. His BRM team-mate Jackie Oliver also had troubles, having to pit when his fire extinguisher was hanging off. The lead swapped between the seven until Stewart took the lead on the 23rd lap, and thereafter it was a charging Hill who posed the main threat, although Rindt, McLaren and Piers Courage were almost side-by-side behind the leaders. Jean-Pierre Beltoise in a Matra charged through the pack to challenge Hill, taking second when Hill's Lotus cruised to a stop on the 64th lap. "Stewart's car was too fast," Hill shrugged. "I could never manage to overtake." On the last lap the 100,000 spectators stood cheering as Stewart, Beltoise, Rindt and McLaren stormed round the circuit at times almost inseparable. Beltoise lead out of the Parabolica but that allowed Stewart and Rindt to slipstream him. As the line approached The Times reported Stewart "by what seemed a stroke of magic urged his car ahead of Rindt by a nose - officially 8/100ths of a second - to win the most thrilling grand prix battle I have seen". So close was the finish that 0.19 seconds covered the first four home. "I had wanted to win in the most convincing way possible," Stewart said. "We had an absolutely terrific scrap, I feel utterly exhausted. But at this moment I couldn't be happier." Stewart's day wasn't over yet as fans poured onto the circuit to celebrate and he and his wife were forced to escape from Monza by climbing out of a washroom window and then hiding in the Dunlop truck before he could be smuggled away.